We are a locally owned and operated printing company serving all of Northeast Pennsylvania and beyond for over 13 years. Our small staff spends the one on one time with each and every customer ensuring that the finished product is to your liking and what you have imagined it would be. 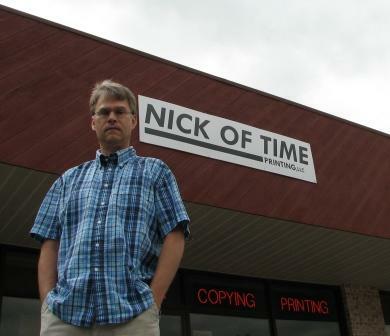 Here at Nick of Time Printing you will always find friendly smiles and great conversations any time of the day. Our doors are open Monday through Friday 8am until 5 pm. Walk in customers are always welcome to browse or borrow our large selection of traditional and custom invitation sample books. You may also call for an appointment if it better suites your schedule. After 5 pm appointments can be made with a week notice or have us deliver our books right to your door.